OLD PARKED CARS. 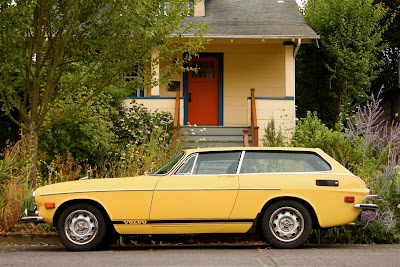 : Best-Of Revisited: 1973 Volvo 1800ES. Best-Of Revisited: 1973 Volvo 1800ES. Smooth rockers indicate a repaint since we spotted it in May 2011 in distant Northwest Portland. Later picked as a Best of the Year. 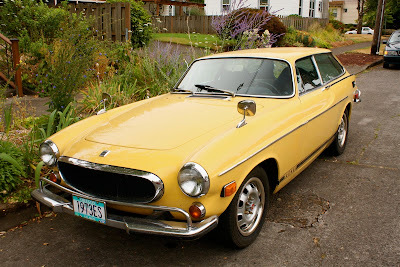 Love these Volvos. Best hands down ever built. They had it all, Looks, style, comfort, and enough performance to get you around but not killed. Check the most recent Volvo commercial at the end they have the 3Million mile one cruising down the highway. I got all excited to see this type of car in a recent commercial. Great find and in beautiful condition. 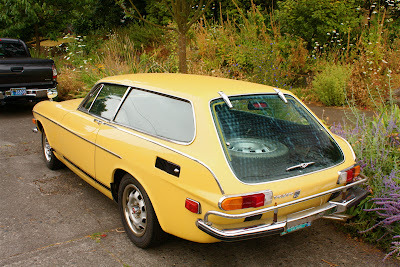 I have a '70 coupe and it's a great car. If I owned this one, I'd lose those weird bumper overriders. I was at a car show on Long Island, New york today. and I met the "million miler" red volvo guy from the commercial. despite its mileage that car is absolutely perfect. the interior was interesting, he had a CB radio and some other 70's trucker plug-in addons mounted up on the dash. Ah, the Volvo P1800ES is a beautiful, and quite rare car as well, with only 8077 made. I had a '73 yellow one for a couple of years, but I enjoyed my '71 black coupe more. I would agree about the front over-rider, but the rear one is protecting the tail light lenses that are nearly impossible to replace. I found one for a client of mine for only $122. Nice glass tailgate, with a crappy latch system.